Because of Augsburg's commitment to service learning, the Washington Center for Internships and Academic Seminars unanimously selected the college as its partner for a two-week seminar one week prior to and during the Republican National Convention, being held in the Twin Cities, Sept. 1-4, 2008. Augsburg will host 250 students from across the country who will interact with local and national politicians, journalists and others during the convention. Twenty Augsburg students will be among those selected to participate in workshops, issue forums and, potentially, convention sessions, in addition to fieldwork assignments. Participants will be required to apply with their school's approval and pay a fee; Augsburg students will have a portion of their fee subsidized by the College. The Washington Center is a nonpartisan, nonprofit educational organization that provides more academic internships than any other group in the U.S. It chose Augsburg for this honor because of the college's commitment to experiential learning and preparing students as leaders and global citizens. 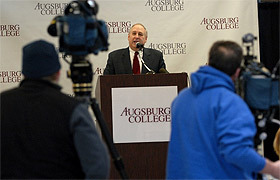 "Augsburg is thrilled to be selected by The Washington Center," said President Pribbenow. "This is an unbelievable honor and a once-in-a-lifetime opportunity for our students and others across the country." At a news conference on Dec. 12, Eugene Alpert, senior vice president of The Washington Center (pictured), said that the 250 student interns who come to the Twin Cities will "play their small part in the larger role of electing the next president of the United States." The first week they will be in seminars at Augsburg, and then receive fieldwork assignments. Each day the students will begin with speakers who will brief them about what to expect that day on the convention floor. On Dec. 9, Dean Barbara Farley was interviewed on KSTP-TV's At Issue show, with host Tom Hauser. She said that the experiential education student interns would receive at the convention would give them the "sense of a significant national event" with a focus on national leadership.